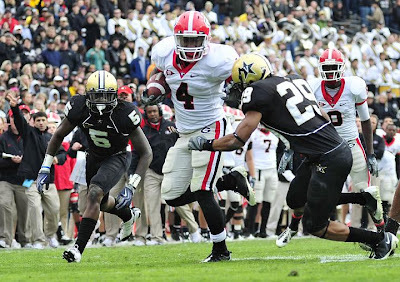 Georgia defeated Vanderbilt 34-10 in Nashville Saturday afternoon. Georgia did not stomp Vandy, nor dominate them. The Dawgs just scored more points than the Commodores. And that is all that mattered this third Saturday in October. Get the "W" and get back to Athens at 4-3, take advantage of a much needed off week, and prepare for the annual clash with Florida in Jacksonville on Halloween. I don't think Georgia really found out anything new and enlightening about themselves against Vanderbilt. They moved the offensive coordinator down to the field from the press box, played five different running backs, and didn't lose the turnover battle. They kept a winless SEC team winless, and quieted the critics for at least two weeks. The Bulldogs still aren't very impressive, nor very good. But they survived to fight another day, with the minuscule chance of knocking off the number one team in the country on their next trek. After all, Gator season is in.